We had just got out of a late meeting when I returned to my desk and saw this outside our office window. A brush fire had broke out on I-805 and the smoke started to fill the sky. We gathered around the window in shock but were relieved when we saw the firefighters arrive. Since the fire was just off the freeway, employees that usually take the I-805 southbound, left the office because we knew that the brush fire would effect traffic. As I got onto the onramp, the rubbernecking had already began. Speeds were less than 10 mph and drivers were noticeably pulling out their camera phones to take a snap. Fortunately, traffic let up after Clairemont Mesa boulevard and I was able to get home at a decent hour. 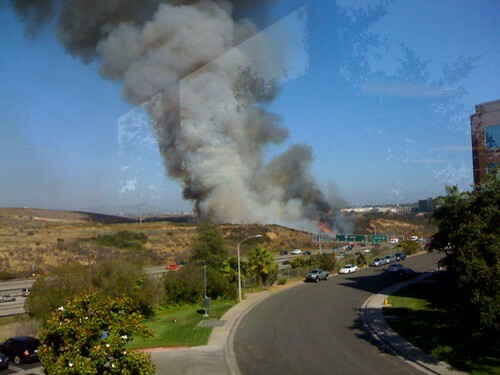 It’s interesting to note that during last year’s firestorm our relatives and friends were scattered all over San Diego. We couldn’t use our cell phones to contact each other so we had to find another means of communication. Interestingly enough, every one of our family members and friends were connected on Myspace. To update our family and friends, we used my Myspace account to send bulletins to everyone ensuring our safety. When we arrived in Arizona, we kept a close eye on the news and found a blog called Wildifires 2007 by SignOnSanDiego.com. They kept us up to date on the status of the fires and had links to evacuation centers. Several posts received comments and questions by subscribers and everyone pulled together to share information on where to find help and shelter. Simply put, social media helped us communicate with our family, friends, and neighbors and proved to be an effective means of communication.